Let’s create the ultimate gaming experience in the vehicle of the future. You are a student, gamer, developer or designer? Use this unique chance to present your idea and business case in the field of in-car Gaming. How can we use gaming technologies to make the customer experience inside cars more advanced? What mind-blowing technology will shape the future of in-car entertainment? The In-Car Gaming Challenge is waiting for your creative ideas and concepts! The way we travel is changing and innovations are shaping our automotive future. Gaming is part of such innovation. Gaming will take in-car entertainment to the next level and give the passengers in all types of vehicles the opportunity to follow their passion while driving. Take part in this rapidly growing business field and shape the future of in-car gaming. Submit your idea and get the chance not only to win great rewards, but also to come to Stuttgart to pitch your project to top executives and employees. Ignite in-car gaming with us. Conceivable options for your concept: location based gaming experience involving environment and landscape; socializing by creating car-to-car gaming use cases; creating full immersion through a gaming experience that addresses several senses or creating your own mind-blowing concept. Inspirations and impulses: autonomous car, daily commute, traffic jam, driver, open developer platform, action games, passengers, location-based content, role-playing games, family trip, AR/VR, scenting, charging time, tactile feedback, casual gaming, racing games, building simulation, immersive gaming seats. 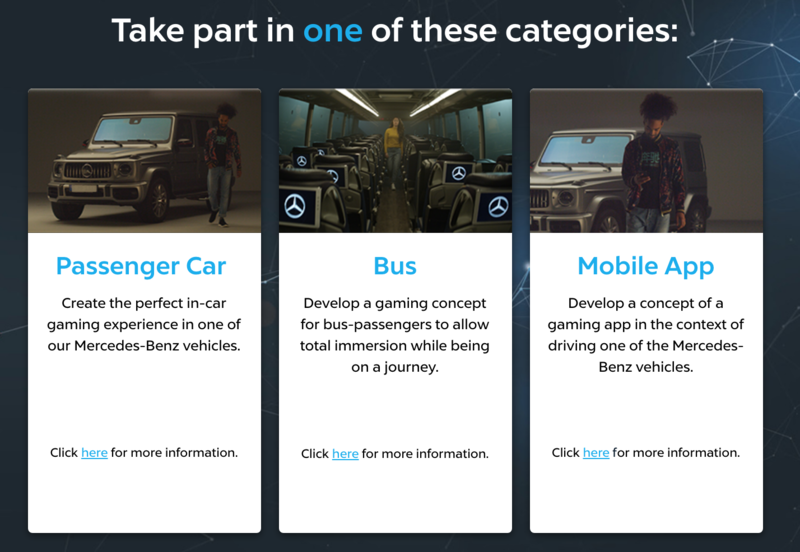 Conceivable options for your concept: challenging the bus-passenger by multi-player gaming (together/against); socializing by linking virtual in-game gathering with real world interaction; focus extreme-gaming-experience. Inspirations and impulses: immersive gaming seats, event-bus, streaming, in-bus gaming-zone, open developer platform, action games, multi-player gaming, location-based content, watch than join, role-playing games, AR/VR, bus-exclusive content, spectators-gaming, minigames, casual gaming, competitive, building simulation, racing games. Bus-specific boundary-conditions: multi-passenger vehicle, predictable in-vessel time, predictable destination. Conceivable options for you concept: location based gaming experience involving environment and landscape; socializing by creating car-to-car gaming use cases; focusing on learning experience for adults and kids or creating your own mind-blowing concept. Inspirations and impulses: autonomous car, daily commute, traffic jam, car-to-car gaming, driver, open developer platform, action games, passengers, location-based content, family trip, role-playing games, AR/VR, scenting, ambient light, Learning games, tactile feedback, casual gaming, community, building simulation, racing games. Present your talent, your idea and concept and bring the in-car gaming to the next level. Present your project with a maximum of 10 slides. Highlight your initial observation, introduce and detail your project key points and show how it can answer the identified problem. Upload your detailed document in PDF format in your personal space. For this second step, you will be helped by a mentor from partner companies. The best projects will access the mentoring phase and will be invited to the Final Event. Features, development stage, customer advantages, business plan. In this phase you will be working with Daimler mentors to prepare and work together on your project for the final event. The finalists will have to pitch their project in front of the jury and will benefit from great visibility among our top management. You will have to show that your solution is the best! This challenge is open worldwide to innovators from all backgrounds. Any person who wants to participate has to be 18 years of age or older. Students, recent graduated students, gamers, developers as well as designers (“Innovators”) individually or in groups as well as Startups are allowed to register for participation. There is no limitation of participants for the event. The size of an innovator’s group is limited to 5 participants each. There is no limitation of participants at Startups. However, at the final event (see below) no group (innovator and Startup) is allowed to bring more than 5 people. Innovators can also participate by themselves without a group. 1st - Take the chance and win 5.000€ including tickets for an ESL tournament for your team! 2nd - Take the chance and win 3.000€ including tickets for an ESL tournament for your team! 3rd - Take the chance and win 2.000€ including tickets for an ESL tournament for your team!